Biofeedback goes by many names Elctro Accupuncture, Electro Dermal Screening, or Bioelectrical Impedance. Electro-Acupuncture by Voll (EAV) testing began in the late 1940’s when Dr. Reinholt Voll, MD, began investigating on the effects of electricity on the human physiology. Dr. Voll was using a technique called Impedance or OHM metering. This type of testing measures the conductivity of objects. This lead him to discover that different areas of the body have different conductivity levels. Biofeedback testing is a scientific based practice called galvanometrics. Galvanometrics refers to the practice of measuring skin resistance to electric current. Your body has a chemical and an electrical system. EAV is a non-invasive way to measure your body’s electrical system using physics. The Avatar device sends a small electric current into the skin to the conductor (a metal rod). Depending on the level of impedance, there will be a reading between 1 – 100. Dr. Voll discovered that on certain specific locations of the anatomy, the electrical flow is much more conductive and these points generally correspond to the Eastern Medical Acupuncture points. The Chinese mapped the body’s meridian pathways thousands of years ago. Every meridian pathway and acupuncture point refers to a different organ or system in the body. 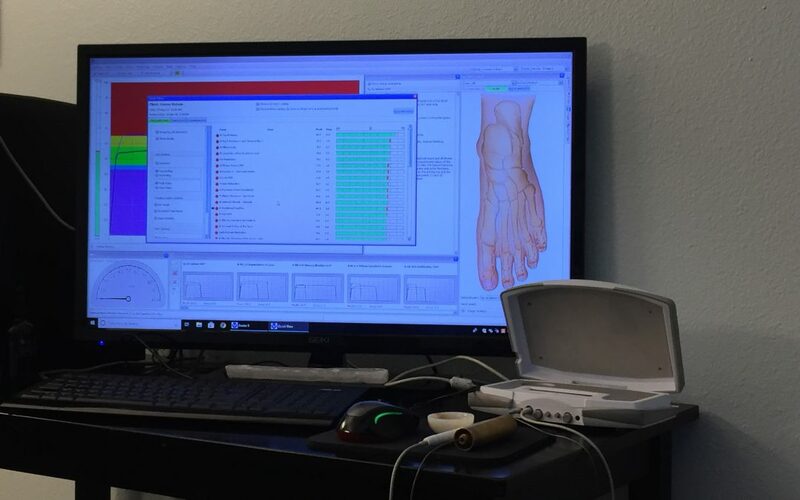 The EAV biofeedback system indirectly measures these meridian pathways and acupuncture points using an electric current which shows imbalances within your body. The EAV is not a diagnostic tool, but between the practitioner and the reading it can measure disturbances in the body’s flow of electro-magnetics. It measures “vibrations,” “stresses,” “excess,” “deficiencies,” and/or “imbalances” associated with body tissues and/or organs. It can help give a big picture of what is going on with your body. This can assist your holistic practitioner to guide you to ultimate health and use of holistic medicine. Once the testing is conducted we can use our natural pharmacy to support you. Our pharmacy includes nutritional supplements, homeopathic remedies, essential oils, and botanicals (herbal supplements). We will also help you be on the most efficient supplement regimens and nutrition recommendations for your individual body to nourish your body.